There are a lot of things that annoy me. It just so happens, a lot of those things are on Facebook. Among those things, are uplifting memes (because I’m a terrible person), but what I hate even more are memes that are uplifting that you must share if you do that thing. Like, “Today is son day! Share this if you love your son!” And then everyone feels obligated to share because God forbid someone think that you don’t love your son because you didn’t share a meme on Facebook. Or “Cancer is bad, share this if you hate cancer!” And no one wants to be the person who doesn’t hate cancer. They’re basically like those horrible chainmails that you had to send to 10 people or your crush would never like you. Obligatory sharing annoys me the most, so I thought it would be fun to make some really ridiculous obligatory sharing memes. 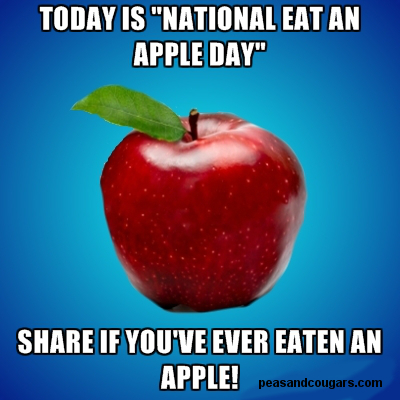 Like for instance, tomorrow, September 17th, is national Eat an Apple Day (because that’s a thing that needs to exist), so of course it needs a meme. I also thought it would be fun to make one that people feel really obligated to share. You can post this and then question all your friends who don’t share it. Hey, maybe there’s even bounty on them you can collect! 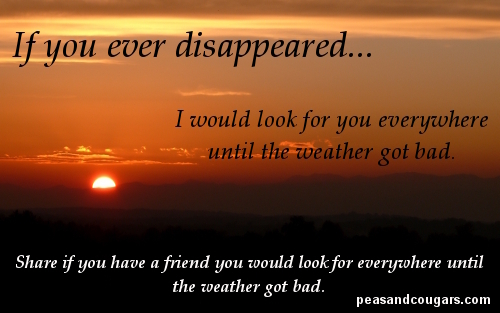 If you want something a little more heartwarming though, there’s nothing like a friend in bad weather meme. And of course, no meme catalog is complete without the one that gently tries to tell your friends how they’re doing the parenting thing all wrong. If you want to share these easily, I’m going to put them on my Facebook page and then see how many likes my page loses! If you do share them, let me know how many friends you lose or if it gets shared again by some gullible poor soul. If one of these goes viral, I’ll even throw a pizza party! Also, I’m sorry for neglecting my blog lately. I just started grad school, which is exciting, but my schedule has basically been, go to work, work, go back home, do two hours of school work, eat dinner, watch an episode of Rick and Morty, pass out. I’m going to find some time soon though to put together some comic ideas I have. Probably. This entry was posted in Human Interactions, Motivational Posters, Nerd Things and tagged facebook, friendship, humor, memes, parenting, sharing. Bookmark the permalink. 97% of people won’t post this random picture of a rock to their wall for one hour. Will you be one of the 3% who cares enough to do it? Aw man, I totally forgot to include something like that! That’s perfect! Yet another reason to avoid Facebook. I’m totally lifting one of your memes to tweet, though. Congrats on grad school! What are you studying? Thanks! Public administration, which sounds kind of boring when I say it out loud… but I like it! 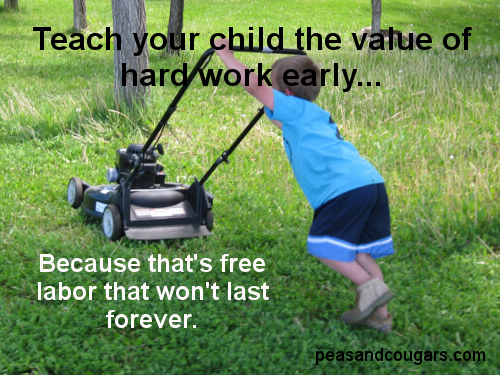 Free labor isn’t as cheap as it once was! My OCD is CDO because it has to be in alphabetical order. Share if you love the alphabet. Can I steal the murder one for my blog? It would fit nicely with a post I’m working on. Yes, steal away! In fact, you *have* to share it if you’ve never murdered anyone! 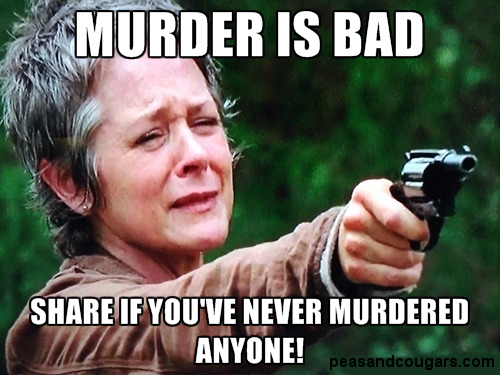 I never completely murdered anyone at all this year, so I’m sharing your murder meme. Thanks for making funny stuff. I never share the memes. Because I’m evil. I’m really really old, so please explain meme. Thank you for your mentorship! It originally meant the way information was spread – from person to person. The Internet, of course, dumbed it down though by slapping a word or phrase on a usually viral picture and calling it a meme. So I guess it’s just a dumb way to spread information from person to person? Thank you! I appreciate your help. I like to keep up with recent vocabulary. I have grandchildren who I can impress. I never share those memes even when they’re more specific and applicable, because I think that chain letters is EXACTLY what they are. I completely ignore all those no matter how ‘great’ the topic of the meme is. Haha, thanks! I’m glad to hear you’re not a murderer! Facebook feels like high school. I hope grad school is so much better! Brilliant! I’ll take them all. That last one is great. I will have to find it on facebook to share. At the end of the day, I just plain don’t love anyone enough to share stupid memes. Sorry hubby and kids, but my self-respect is more important! The only memes I share are those who have passed my snort test – no, not cocaine or anything – when something is really, over the top, hilarious, I’ll snort when I laugh. If it didn’t make me snort, it doesn’t get shared. Do you think things would be more likely or less likely to pass your snort test if you actually snorted cocaine first? These are the things I wonder about. Hypothetically speaking, cocaine snorting may increase the likelihood of things passing the snort test, which would then reduce the validity of said snort test. This needed to be said very much and has prevented my eyeballs from rolling out of my head. Thank you. I personally found your memes quite inspiring. I mean, I feel so much more inclined to share yours than almost every one I have ever seen. You forgot to include at least one with grumpy cat and another one with a pug. I mean, we have to stick with what’s popular yeah? I forgive you for neglecting your blog. Kind of. I might even still look for you in the rain until the weather got bad. Late to the party, let me see how this turns out. It occurs to me that for each and every one of you on my friends list, I catch myself looking at your unnecessary memes, sharing Snopes debunked myths… We will see who will take the time to read this message until the end. I’m going to be watching to see who takes care of the friendship, just like me with my unnecessary meme. Leave ONE WORD AS TO HOW WE MET. Only ONE word or should I say; ONE WORD ONLY!!! I’ve never murdered anyone while eating an apple. Should I post that? I was just carrying on about this exact topic. I made my own meme and posted it on my instagram page (because I have already made an agreement with myself to quit Facebook). I ❤ this post! OMG yes! I hate uplifting memes!!! Except that murder one of yours is pretty uplifting AND freaking brilliant! Haha, thanks for sharing it! I’m glad you haven’t murdered anyone… yet. Just found your blog and I think I’m hooked! Please check out my new blog I just started. I hope to make people pee their pants, or at least lol a little.